Last major engine of this kind available, out of production at Polini. A complete kit 70cc aluminum, 47mm diameter, 6 transfers, large exhaust W ... for guaranteed performance. 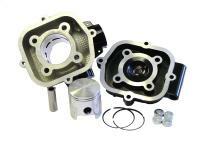 Cylinder kit Franco Morini G304-303 suitable for the Malaguti Fifty 50 Top.